For the past four years, one senior boy has been spending his time after school preparing for rodeos that take place on weekends. Senior Cole Patterson gave up basketball his senior year to focus more on rodeo. 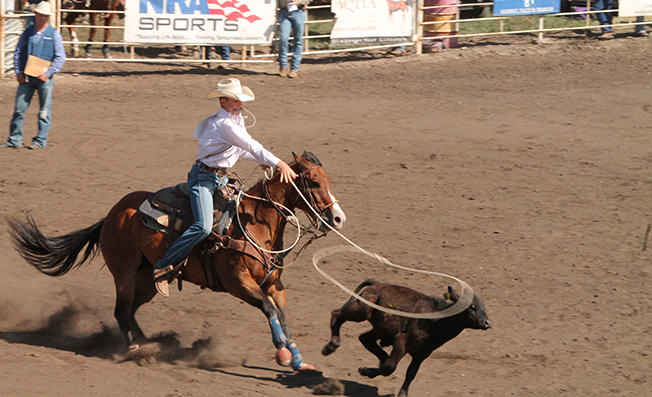 Patterson competes in two different timed events, team roping and calf roping. In calf roping, after a catch is made the cowboy dismounts, sprints to the calf and tosses it on its side. With a small rope, known as a pigging string, usually held in the cowboy’s teeth, any three of the calf’s legs are tied securely. Time stops when the cowboy throws up his hands. “I like calf roping better because I only have to rely on myself and my horse, not someone else and their horse,” Patterson said. Team roping is where the team ropers start from the box. The header, who ropes the head of the steer, is the first out trying to rope the head as quickly as possible without breaking the barrier. Once the catch is made, the header dallies and turns the steer left. This opens up the way for the heeler to rope the legs. The clock is stopped when there is no slack in both ropes and the horses face each other. Although rodeo is not a part of the Kansas State High School Activities Association, it is a part of the Kansas High School Rodeo Association. Currently the senior is sitting fourth in the state in calf roping, but only 13 points away from first place. I am so excited to read this article. Most high schools don’t really recognize rodeo as a “sport”. I have been around rodeo most of my life and believe me I have seen how hard people have to work to succeed. To be successful, it takes several hours a day trying to perfect every aspect of your event. Thank you Kaitlyn for featuring this young man! !